Contact Eco Efficient Dundee for immediate gas and boiler leaks repairs. Leaking gas and boiler releases natural gas to the air which when breathed in has negative effects on your body. You need a company that understands the importance of quick but professional boiler repair services. Unfortunately, your boiler can continue leaking for some time without your knowledge. This is because you need more than the visual signs to identify a leaking boiler. For that reason, our Gas Safe Registered engineers have the skills to identify boiler leaks. They employ modern detection tools and techniques to establish the leak within no time. Safety is important. It helps if you can identify gas leaks even before you call our technicians. Gas leaks can lead to stomach pains, difficulty in breathing, fatigue, confusion, and dizziness. If either you or anyone else has been experiencing the above signs and symptoms, contact us for boiler inspection service. If the leak is major, your system will produce a hissing sound. As a safety precaution, open all the windows and call our engineers immediately. Leaking gas can cause explosions so take immediate action. Our engineers will respond to your call ready to arrest the issue immediately. It will take us a maximum of one hour to arrive to your premises. To be sure you are on the safe side, you should service your boiler often times. 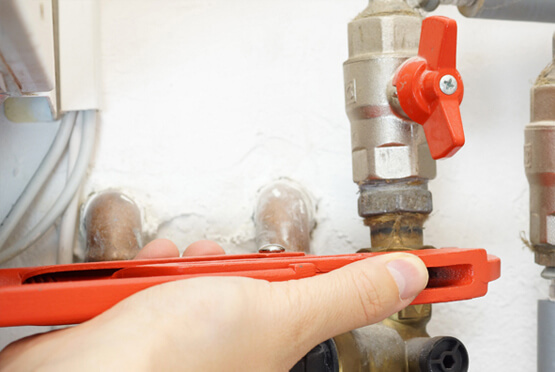 If our boiler has any issue including anything that can lead to leaks, it is identified and repaired during servicing. Some of the causes of gas and boiler leaks are corrosion, damaged valves and pumps, faulty pipe connection, and malfunctioned pressure and temperature valves. Call us anytime even if it is during public holidays or at night; we operate 24 hours. Our well informed and helpful customer care team is available to receive your calls anytime. Our mobile vans are ready and packed with everything we need to resolve the leak. We understand the value of using genuine parts in repairs. We have partnerships with the best boiler manufacturers. When we need any part, whether it is a valve, seal, or pipes, manufactures sends us the parts at affordable prices. Avoid using cheap parts as they do not meet the industry standard and will wear out soon. They also make your gas leak issue to persist costing you more repairs. Talk to us today for long lasting gas and boiler services in Dundee. We charge competitive prices for boiler inspection, servicing and repair services. We assure you that you will not find a match for our prices in Longforgan, Tealing, Monikie, Ninewells, and Monifieth. Call Eco Efficient Dundee today and you will see the difference!